Bellossom in game: 333 Who? Important notice! Pokemon Bellossom is a fictional character of humans. 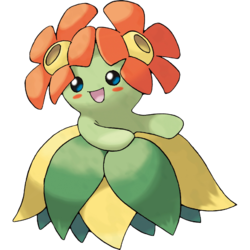 Bellossom is a primarily green Pokémon with circular blue eyes and red markings on its cheeks. It has two bright red flowers on its head and green and yellow leaves around its waist that resemble a skirt, all adding to the appearance of a hula dancer. Bellossom's petals are said to be more beautiful the worse the Gloom it evolved from smelled. When it rubs the petals on its head together, it composes a pleasing sound. Bellossom does not possess feet; in the anime, its center-most leaves bent as it was getting ready to spring, suggesting that it uses its leaves as substitutes for feet or legs. 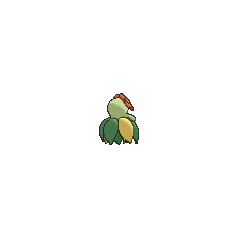 However, the Pokédex does classify it as a biped. Bellossom's first major appearance was in Flower Power. A girl named Bailey had a pair that she wanted to be able to a dance, but one of them was having trouble with the somersault that the dance required. In Whichever Way the Wind Blows, there was a meadow in which Gloom evolved by collecting sediments of either Leaf Stones or Sun Stones that blew in the wind. The Vileplume and Bellossom were feuding in that area. A Bellossom under the ownership of Noelle appeared in Strategy Begins at Home!. A Bellossom under the ownership of a female Trainer appeared in Thawing an Icy Panic! ; Chespin wanted to give it a flower, but it refused its request. 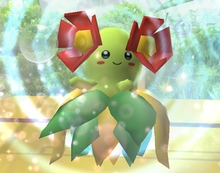 A Bellossom appeared in Pikachu and the Pokémon Music Squad. Bellossom first appeared in Pikachu's Rescue Adventure. A Bellossom was one of the Pokémon seen at the Pokémon Swap Meet in Tricks of the Trade. Two Bellossom appeared in The Grass Route. One belonged to Ephraim's parents and another belonged to a Trainer participating in the Grass Tournament. Bellossom were dancing in a grassy field and Togepi joined in, in the episode Houndoom's Special Delivery. Three Bellossom appeared in Brock's dream in Sick Daze, dancing and singing. Bellossom was in a garden that Ash's Bayleef ran off to in Turning Over a New Bayleef. Multiple Bellossom also appeared in Celebi: Voice of the Forest. Three Bellossom were seen in the wild in The Legend of Thunder!. Three Bellossom were among the inhabitants of an oasis just for Pokémon in Got Miltank?. Multiple Bellossom were among the feuding Pokémon at Professor Oak's Laboratory in Bulbasaur... the Ambassador!. Tammy from I Politoed Ya So! had some Bellossom in her cheerleading squad. Several Bellossom were among the inhabitants of the Dragon Holy Land in Fangs for Nothin'. Three Bellossom appeared in the wild in Hatch Me If You Can. 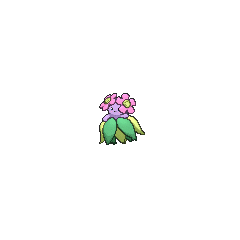 Several Bellossom were among the Pokémon seen at Professor Oak's Laboratory in Showdown at the Oak Corral. A Bellossom was used by one of the students of the Pokémon Trainer's School in Gonna Rule The School!. A Coordinator's Bellossom appeared in Win, Lose or Drew! competing in the Slateport Contest. A Bellossom appeared in Arriving in Style! under the ownership of a Pokémon Stylist competing in the Hearthome Collection. Two Bellossom made a cameo in the third Diamond & Pearl series Pokémon movie, Arceus and the Jewel of Life. A Bellossom appeared in Dawn of a Royal Day! under the ownership of a Pokémon Coordinator competing in the Arrowroot Contest. Bellossom also appeared in Zoroark: Master of Illusions, as few of the many wild Pokémon who live in Crown City. A Bellossom appeared in The Island of Illusions! as an image. A group of Bellossom also appeared in Genesect and the Legend Awakened at Pokémon Hills. A Bellossom appeared as a plush toy in A Jolting Switcheroo!. Multiple Bellossom also appeared in Thawing an Icy Panic! in Ramos' ranch. EP122 Bellossom Ash's Pokédex Bellossom, the Flower Pokémon. When these Pokémon move, their delicate petals rub together, composing a pleasant sound. They are also known for their unique acrobatic dancing abilities. In Irked Igglybuff and Curmudgeonly Cleffa, a Bellossom ice sculpture was one of the many sculpture Pryce made in his gym. "From time to time, these beautiful flower Pokémon will gather in numbers and perform an odd sort of dance to call out the sun. While in the midst of this strange exhibition, their petals brush together to compose a peaceful and soothing melody. A Gloom will only evolve into a Bellossom if it's exposed to a Sun Stone." 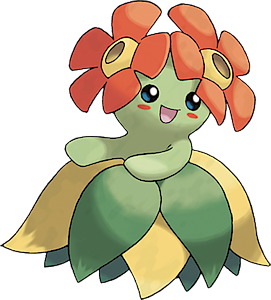 In Generation II, Bellossom could not learn Sludge Bomb from TM36, despite its pre-evolutions being able to do so. This was fixed starting in Generation III.